Going on a date is not usually a very cheap endeavor. Even when planning something simple like going out for a nice meal at a moderately priced restaurant or hitting a bar for a few drinks, the tab at the end of the night tends can easily run to up a 3 figure number. If you are in a relationship or go on a date at least once a week, those dates –along with any shopping and/or grooming in preparation for them – can easily run into four or even five figure numbers by the end of the year. While we are definitely not advocating putting your love life on hold in the interest of your long term financial interests, we certainly do recommend finding a way to mitigate the kind of spending that is usual on most dates. With Valentine’s coming up, we thought it would be the perfect time to go over some creative dates ideas that are sure to not only impress your date, but do not require you to break the bank – saving you a small fortune across the years. Animal Shelters throughout the world are always in need of good helping hands to aid them in caring for our furry friends in need. Taking your partner to a shelter on a date is a wonderful way to spend the day getting to know each other better and seeing each other’s gentler side as you interact with the animals. There you will perform different tasks such as walking and playing the dogs, grooming the cats, or helping with miscellaneous chores that will help improve the animal’s living conditions. In doing so, you will be able to gauge how your partner treats animals – a great indicator of their overall kindness and noble spirit. Volunteering your time for a worthy cause can be a fantastically uplifting experience, and if you add a whole lot of puppy love to the equation you’ll have yourself one of the most rewarding dates you’ll ever be on. A well-executed game night can be a night of excitement, fun and plenty of good natured competitiveness. Choosing the right board games or video games is crucial; you should opt for lighthearted games that expose your best qualities or help you learn more about each other. Yes, that means Monopoly is completely off the table. Instead, choose board games like Jenga, Mancala, or Scrabble or video games like Mario Kart or Overcooked that will keep things playful and upbeat. If you want to add some extra excitement to your game night, you can also team up to play some casino games online. Compared to land based casinos, online sites like Ninjacasino allow much lower limits on all of their table games and slots, allowing you a lot more bang for your buck. If you choose a game with a high return rate a small deposit of $20 could easily last you all night – providing you plenty of adrenaline for you and your date along the way and, if you are lucky, you could even end up making some money. Most libraries and bookstores like Barnes and Nobles will routinely host readings from author’s promoting their latest work. Usually free events to assist to, going to a reading is a wonderful way to surround yourself with culture and add new material to your reading list. Usually you will also get the chance to ask questions to the author and get a behind the scenes glimpse into his work, as well as meet other lovers of literature and learn more about the work. After the reading, you and your date can go grab a coffee and discuss the reading, as well as your favorite literary works. Taking a hike through the great outdoors is always a liberating break from life’s hustle and bustle. 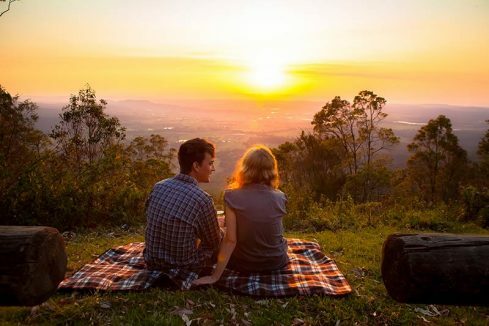 Giving you the chance to revel in some greenery and catch some fresh air, a sunset hike date is a perfect opportunity to take your date on a quick adventure where it will just be you two in the world. Ideally, you will want to hike to the top of a large hill or peak where you can get a good panoramic site of the city as the sun goes down. Once you find that spot, break out the picnic basket and enjoy some nice wine, some snacks, and the best view in the city just for you two. Take ‘Netflix and Chill’ to the next level by channeling your inner child and building the most kickass pillow fort ever made. Take every blanket and pillow you find in your house and construct the fort together. To make it even cozier, find those Christmas lights in the attic and use them to decorate the fort throughout. Make sure to pack the fort with several games and movies, as well as plenty of popcorn, wine and candy and you are sure to have an unforgettable evening together, away from the real world and all the trappings of adulthood. In the past few years, wine and paint nights have become hugely popular around the world. A simple yet classic concept, you and your date will spend the entire evening trying to channel your inner Jackson Pollock as you drink copious amounts of wine to inspire your art. But while attending one of these events at a local bar or restaurant may set you back a good $30-$50 per person, hosting your own private wine and paint night at home is surprisingly cheap and easy to plan – not to mention a lot of fun! Take turns creating different types of paintings; from realistic paintings of a bowl of fruit, to the landscapes outside the window, to abstract portraits of each other, you’ll have plenty of laughs as you show off your artistic streak – or lack thereof. Either way, you’ll both have something to proudly display on the fridge the next day.